Despite Fact Checks, Romney Escalates Welfare Work Requirement Charge : It's All Politics Wednesday marks the 16th anniversary of President Clinton's welfare overhaul. Republican Mitt Romney keeps saying that President Obama has gutted the law — even though every major fact-checking organization says the claims are false. 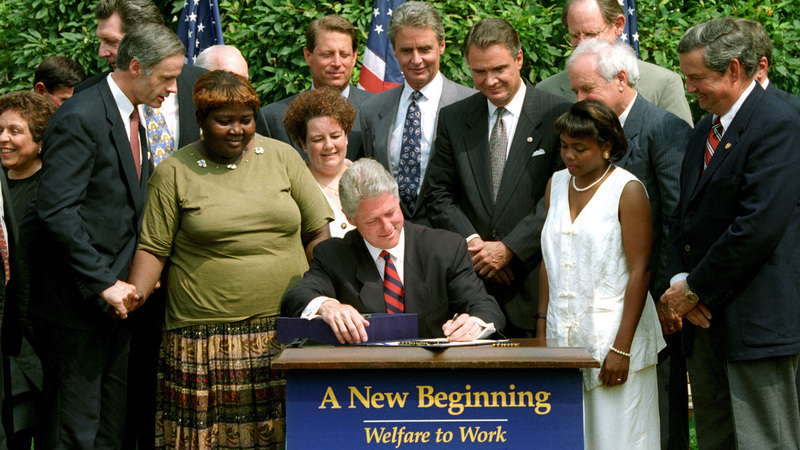 President Clinton signs the welfare reform law on Aug. 22, 1996. Wednesday marks the 16th anniversary of President Clinton's welfare overhaul. That law has become a major issue in this year's presidential campaign. Romney rolled out his line of attack two weeks ago in an ad that says: "On July 12th, President Obama quietly announced a plan to gut welfare reform by dropping work requirements. Under Obama's plan, you wouldn't have to work and wouldn't have to train for a job. They just send you your welfare check." Since then, it's become a constant refrain in more ads and on the stump. "How in the world could he not understand the power of work, the dignity of work?" Romney said last week in Zanesville, Ohio. "And taking work out of welfare is something I'll change. I'll tell you that — day one." The fact-checking website PolitiFact says Romney's claims are "pants on fire" bogus. The Washington Post's fact checker awarded four Pinocchios, its highest rating. "A Mitt Romney TV ad claims the Obama administration has adopted 'a plan to gut welfare reform by dropping work requirements.' The plan does neither of those things." "Work requirements are not simply being 'dropped.' States may now change the requirements — revising, adding or eliminating them — as part of a federally approved state-specific plan to increase job placement." "And it won't 'gut' the 1996 law to ease the requirement. Benefits still won't be paid beyond an allotted time, whether the recipient is working or not." Even a Republican architect of the law, Ron Haskins, told NPR: "There's no plausible scenario under which it really constitutes a serious attack on welfare reform." Still, the accusation endures. The Republican National Committee released an ad Wednesday noting the 16th anniversary of the law, and stating: "If Barack Obama had his way, this day would have never happened." And the Romney campaign put out a memo Wednesday repeating the claim that Obama gutted the Clinton-era welfare reforms after taking office. This specific attack about welfare ties into a broader concern that many Republicans share: Romney often argues that Obama and the Democrats are making America a government-dependent society. Pam Malcolm, who attended a Romney rally outside of Cleveland a few months ago, agreed. Princeton University political scientist Martin Gilens, who wrote the book Why Americans Hate Welfare: Race, Media and the Politics of Antipoverty Policy, said there's another unspoken factor in all of this. "I do think a lot of it has to do with race," he said. Gillens said his research shows that Americans think about welfare in a way that aligns pretty neatly with their perceptions about race. For example, whites tend to believe that most poor people are black. But actually, poor people are more likely to be white than black or Hispanic. Gillens said it's impossible to know whether the Romney campaign decided to play into a racial strategy or whether it's an accident. But in a way, it doesn't matter. "Regardless of what their conscious motivations are, the impact of these kinds of attacks on welfare and, in particular, on the perceived lack of work ethic among welfare recipients, plays out racially and taps into Americans' views of blacks and other racial stereotypes," he said. Robert Rector of the conservative Heritage Foundation calls that claim preposterous. "The left declared that welfare reform itself was racist," he said. "It's not a racial issue. It is an issue of extraordinary budgetary cost and an increasing level of dependence among all kinds of groups in our society." Rector was co-author of a blog post on the Heritage Foundation website last month claiming that Obama "guts welfare reform." So happy anniversary, welfare reform. On your sweet 16th, everyone is talking about you.